Although most modern Jews have abandoned the practice of Kapores, in some parts of the community, it is still common. I’m not sure what the Masorti movement thinks it will accomplish by joining with the SPCA -Tel Aviv, ince the parts of the community that are practicing kapores aren’t the parts likely to care what the masorti movement does, but all in all, it can’t hurt. In the story from which I took this post’s name ( an adapted tale based on the original story by Sholom Aleichem) the author in fact points out that the practice of taking a chicken (male for men, female for women) swinging it over one’s head to “catch” one’s sins, and then slaughtering it, is not exactly halacha ( Jewish law). And while in general one ought not to depend on fiction for accurate portrayals of Jewish law, in this case, it happens to be correct. Not only is “Where is it written?” a good response, but where it is written, the rabbis aren’t too happy with it, considering it (Like many folk customs which have become embedded in Jewish practice) akin to idolatry, or at lest very improper. And reasonably so, while it might be a midat chesed (act of mercy) to buy a chicken which one will then donate to the poor to eat (although that does raise some questions about how that came about… really? We’re giving our sins to the poor to eat? Hmmm. I hear a sin eater story in here somewhere for those of us familiar with that southern custom), the problems with the ritual as a whole are numerous. For now, let’s set aside the problem of tzaar ba’alei chaim – the requirement not to be cruel to animals (in this case, by packing them in itty bitty crates sitting around in the sun all day until it’s time for them to be grabbed and swung around by the feet) and concentrate on the symbolism of the custom itself. While there seems to be some kind of yearning for authenticity as played by certain elements of the Jewish community which favor dress styles not native to Israel, but rather early modern Europe, I’ve never been able to fathom why people attach their sentiments to these kinds of customs (including within the community, but without it as well). There’s somehow a sense that it looks or feels more authentic – but how could it be? If Judaism and our peoplehood is based upon our connection to God through God’s commandments, as the Torah tells us, then one couldn’t possibly repent by swinging a chicken around. I far prefer the formulation of the Talmud (Brachot 17a) (See the bottom of the post) which likens the fat that one loses during a fast to the fat offered as a sacrifice in the times when the Temple stood. That makes far more sense to me. Most importantly, if w are repenting, we cannot hope to shed our sins elsewhere without the ful act of teshuvah that goes with it. Whether we are speaking of ourselves as individuals, our individual communities, or Israel as a whole, our own sins cannot be displaced by any symbolic act, whether we’re talking about swinging a chicken or saying that the other party involved has done bad things and so they have to repent first. NO, we are responsible for the sins of ourselves, and the sins of our people. If we wish for peace, we have to act first to recognize and admit our sins; to make reparation to those whom we’ve harmed; to confess to God – because in doing so, we humble ourselves and take into our hearts that our acts, whether accidental or intentional, whether preemptive or retaliatory, were wrong; and then to not do it again when the opportunity presents itself. Stop building settlements, stop demolishing homes, stop blaming others for acts over which we have agency. Goldstone isn’t our enemy, and taking on against him, as the Rabbinical Assembly has just, entirely ridiculously, done, will not bring peace. As long as we treat acts for which we need to repent as thought they were public relations bloopers which can be addressed if we only change our spin, there will not be kaparah, atonement, no matter how long we fast on Yom Kippur, no matter how many chickens we swing. We have to do the work ourselves. 3 “Why, when we fasted, did You not see? 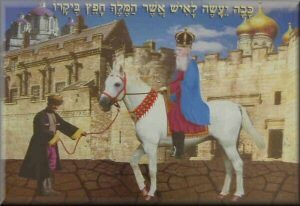 Giving the kaparot chicken to the poor is a form of trying to call upon the phenomenon of “tsedaka tatzil mimavet (giving charity rescues us from a death decree)”. Not “trying to give the poor your sins”. Also, I’ve seen plenty of chickens treated gently and humanely throughout the kaparot process. No crowded cages, no swinging by the feet, etc. That doesn’t make it my sin-extirpating ritual of choice, (I prefer Tashlich), but kaparot as a ritual isn’t as ridiculous or barbaric as you suggest. It has roots both in (pagan) superstition and in the temple ritual of sin offerings. Here’s an idea: The kapores ipod application. You push the kapores button and swing the ipod over your head as synthetic chicken sounds are heard through the earphones and then a donation is made to your favorite charity. I just walked past an animal rescue/shelter where someone had brought in one of those chickens. It has a broken neck. The owner immediately drove it to a vet. This traditional is disgusting.